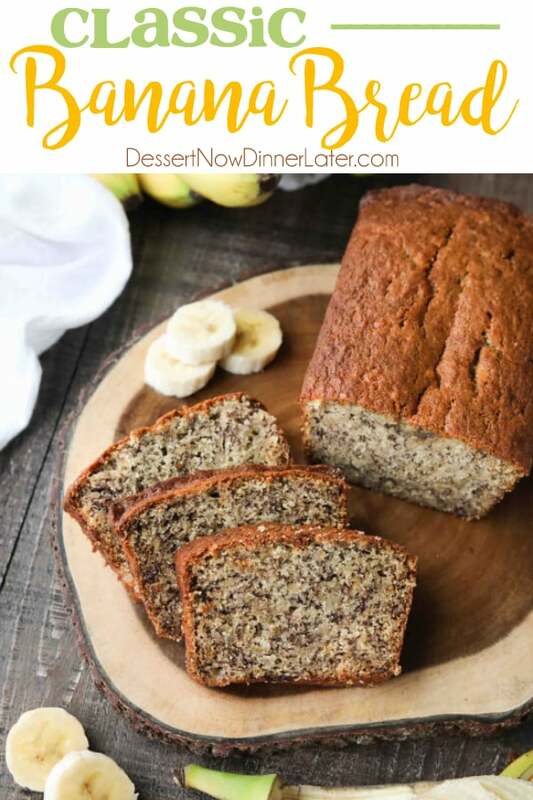 Banana Bread Recipe - Dessert Now, Dinner Later! 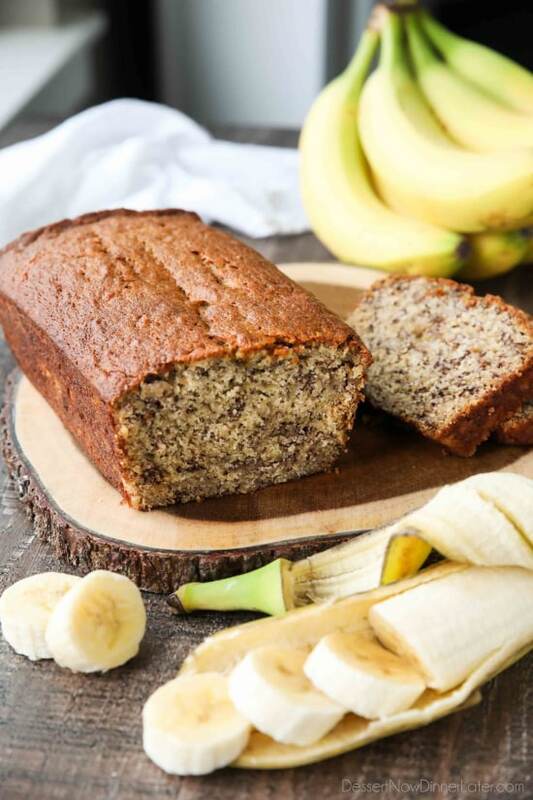 Use up those ripe bananas in this easy Banana Bread Recipe. 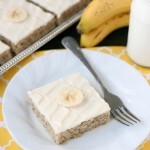 The most delicious, moist, classic banana bread recipe. No mixer needed for this one-bowl quick bread. I realized that I’ve been putting spins on a lot of classic recipes, but I haven’t been sharing them in their simplest forms. 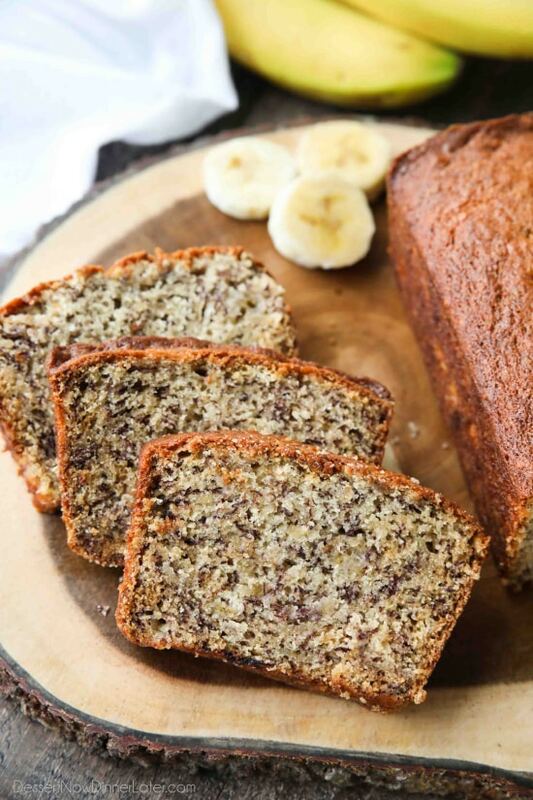 So today I am sharing this classic banana bread recipe as-is — no extras. 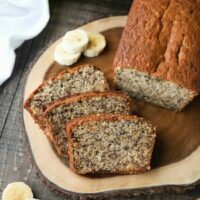 Of course if you want a fancier banana bread, you could try this Cinnamon Swirl Banana Bread, or this Sour Cream Banana-Berry Bread. And if you’d rather have cake than bread, this Double Chocolate Banana Cake is amazing!!! 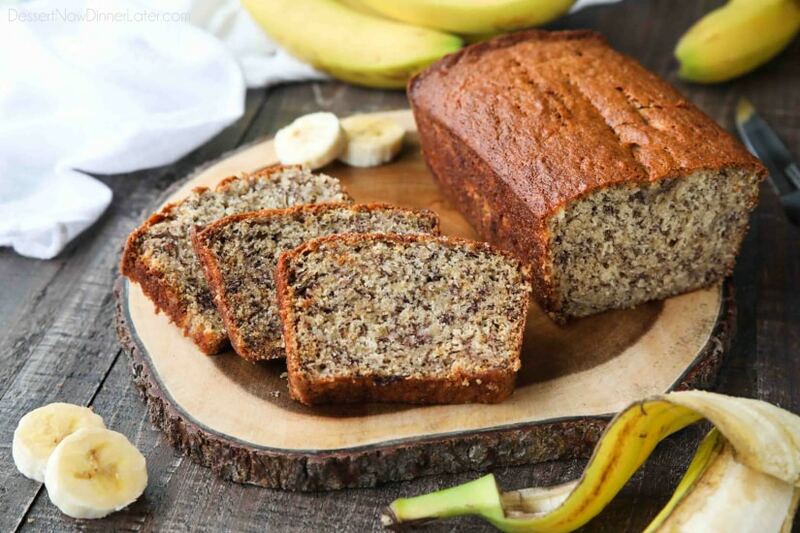 The trick to a good banana bread recipe is making sure that you have over-ripe bananas. (NOT like the ones used for food-styling in the pictures of this post.) The banana peel should be heavily speckled and at least half browned. The insides should be soft and browning too. Whenever my bananas have browned, I break them into fourths and freeze them in a zip-top bag. They work great for smoothies, cake, or in a bread like this. If you use frozen bananas, and have a lot liquid after they have thawed, be sure to drain half of it before proceeding. You can thaw bananas in the refrigerator overnight, or microwave frozen bananas for 30 seconds. 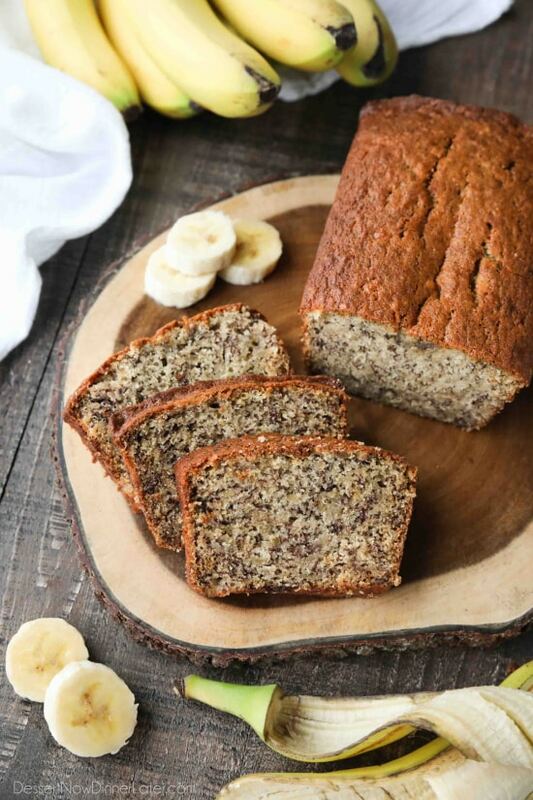 This banana bread recipe is a favorite of ours and makes a great breakfast or neighbor gift. I hope you love it too! Preheat oven to 350 degrees Fahrenheit. Butter and flour an 8x4-inch bread pan or use parchment paper on the bottom and cooking spray on the sides. In a large bowl, mash bananas thoroughly with a fork, until smooth. Add melted butter, sugar, egg, and vanilla. Mix well. Add the flour, baking soda and salt. Stir the dry ingredients slightly before folding them into the wet batter. 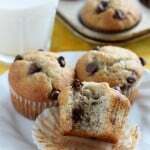 Mix until flour barely disappears. Pour batter into the prepared bread pan. Bake for 50-60 minutes, or until a toothpick comes out clean from the center. Allow bread to cool in pan for 5 minutes before inverting; then cool completely on a cooling rack. Slice with a serrated knife and serve. Wrap leftovers in plastic wrap to keep fresh up to 1 week. I don’t have any pure vanilla on hand, will vanilla extract work? 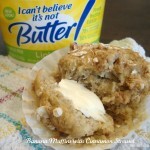 Wonderful recipe turns outt perfectly ever time I’even add the extra banana here and there it’s just good. 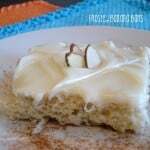 I’m so glad you are enjoying this recipe Eileen!